During an interview, Mr Atiq Shahid, a New York resident, was expressing his shock that despite his clear intention of revisiting the Pakistan flood crisis and returning to further assist, his request for a 60-day visa was denied. “This is a consistent abuse,” said the field director. He further remarked, “I thank the Pakistan consulate in New York for saving me valuable time, and money,” in his quest to distribute the main articles of aid required by the flood victims during the winter. “I didn’t think any other 20 million people could be more deserving of aid at this time, but we won’t find a shortage at home either,” he said. Mr Atiq Shahid spoke to the Islamic Post before the commencement of his third trip as the head of an AMMRT field unit. The first mission was after the 2005 earthquake, the second at the ravage point of the flood earlier this year. 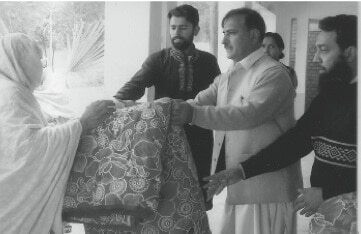 After the initial flood relief efforts, Mr Atiq Shahid returned to the US with his workers, having overseen the disbursement of quilts, donated cash, dry rations, and other necessary items. However, due to security concerns, that team was unable to distribute items by hand, but were forced to utilize the help of local assistants of good reputation. Donations remained undistributed after the mission and it was Mr Atiq Shahid’s obligation to make sure the funds and goods arrived in the hands of flood victims, visiting tent villages and those sheltering in cardboard homes. However, he was denied the necessary time allotment in Pakistan to do so effectively. The field director was well aware that during a former Pakistan mission to assist the earthquake victims in 2005, a lot of the relief items brought -extensive equipment, tents, blankets and medical supplies- were suspected by Mr Atiq to have been sold on the black market. This was confirmed after an investigation. Mr Atiq Shahid, manager, at the time, of the team of surgeons and nurses who set up base at in northern Pakistan at the Ayub Medical Complex in Abbotabad, still persevered in the AMMRT mission, and set about ensuring that items would not be stolen from the people again. Over the years, hundreds of thousands of Pakistanis have helped by American Muslims whenever any help is needed, while most Pakistanis are living on welfare and American Muslim tax payer dollars. “The Pakistanis in the New York consulate hate us. They hate the American Muslims,” said Mr Atiq Shahid. Their spite is manifested and confirmed time and again from their countenances, words and deeds. Such behavior is not the way of any Islam. It is most unfortunate that despite being founded on the richest of cultures in its strict observance Islamic etiquette, the practice of Islam the land of the saints now lies decimated to such a degree. “It is ironic,” said Field Director Khalifa Atiq Shahid, “that Pakistan's Ambassador to the United States (Husain Haqqani) calls on support from smaller groups and private donors in America to help the flood victims, but we arrive at his doorstep and are denied proper time on our visas and even outright insulted, time and again. This is not the first time these things have occurred in that office.” Mr Haqqani has also denounced the lack of focus on the dire humanitarian situation of the flood victims, but at the consulate, the same care and attention is lacking. Whether to do relief work or for study, American Muslims have shouldered all expenses incurred on their trips abroad. Shockingly, the American Muslim Medical Relief Team received what amounted to no recognition, nor any sign of appreciation from the Pakistani government for their treatment of the many critically injured victims suffering from burns, severe fractures, internal injuries and chronic infections during the earthquake crisis. Nevertheless, they expect to at least be able to complete their mission in the flood-affected region: helping prevent the spread of disease, and aiding in the general recovery of afflicted areas. It is well known and acknowledged by the United Nations that tens of millions of people in Pakistan are still living “without basic necessities after their homes and sources of livelihood were washed away or damaged by the floods that swamped the provinces of Khyber, Pakhtunkhwa, Sindh, Punjab and Balochistan along the Indus River basin following the heavy monsoon rains that began in July.” What is to become of them? The New York consulate would do better to be part of the solution, instead of fostering the current norm of black markets, ingratitude, and the consequent suffering of their own. 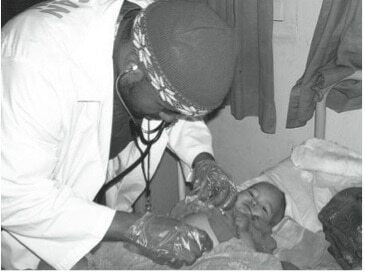 Dr Jemille N. Smith, above, gives care to an infant during the 2005 earthquake crisis.